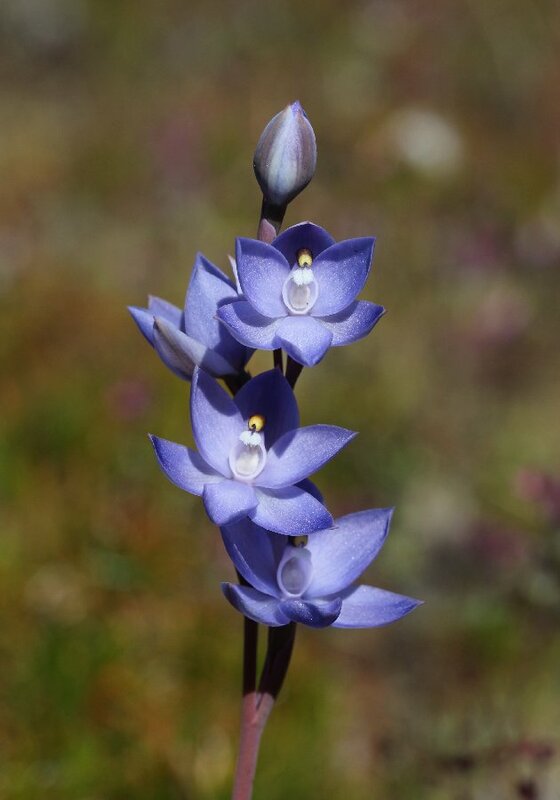 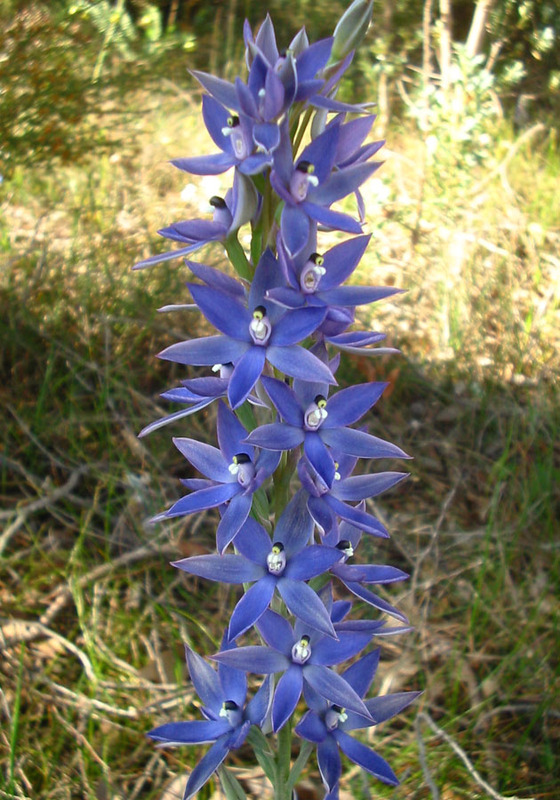 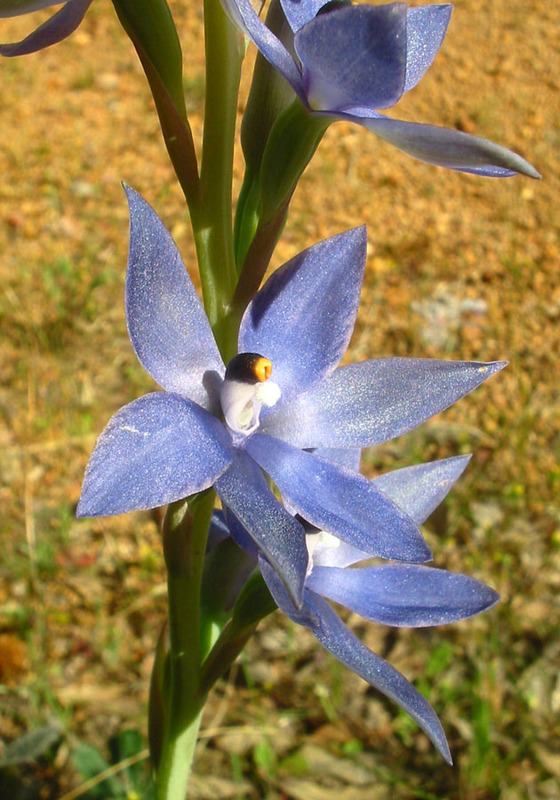 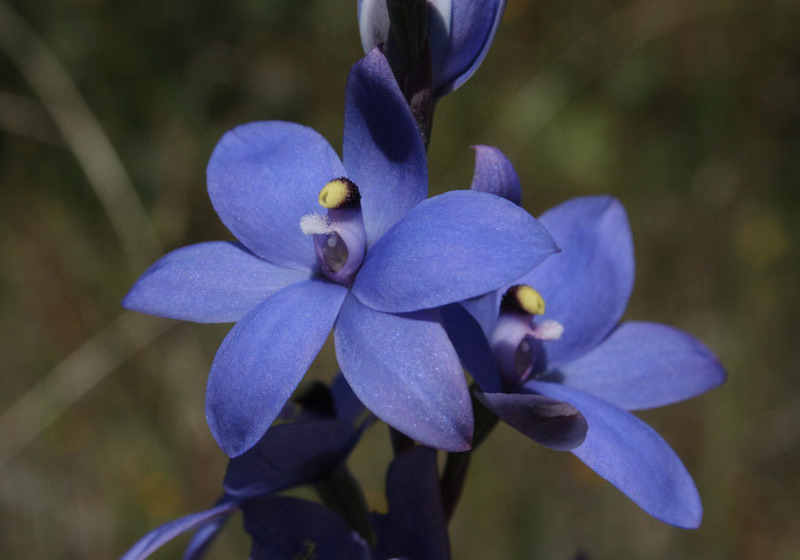 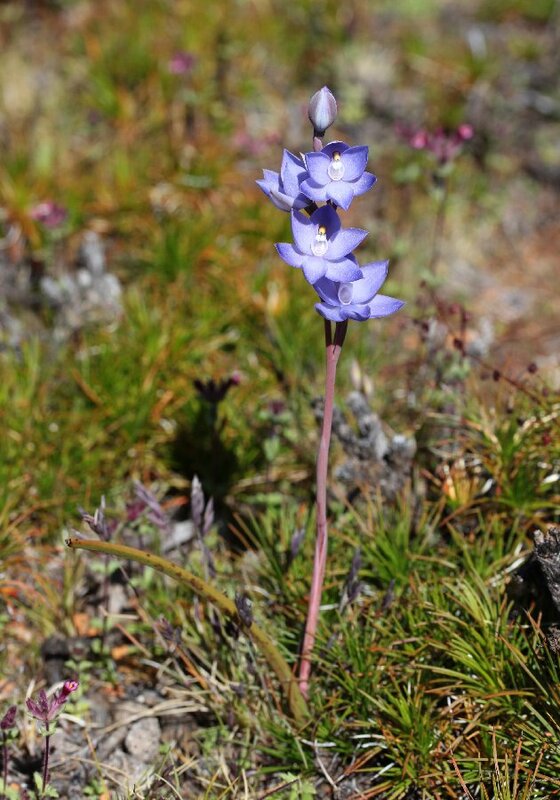 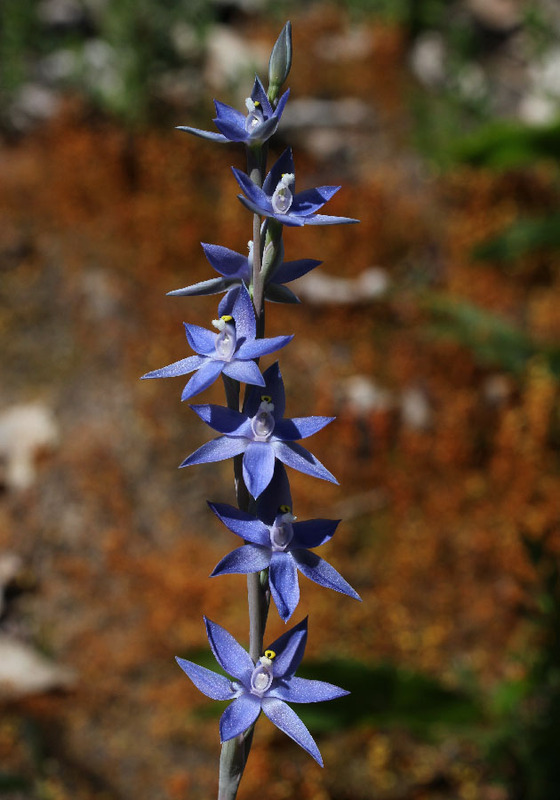 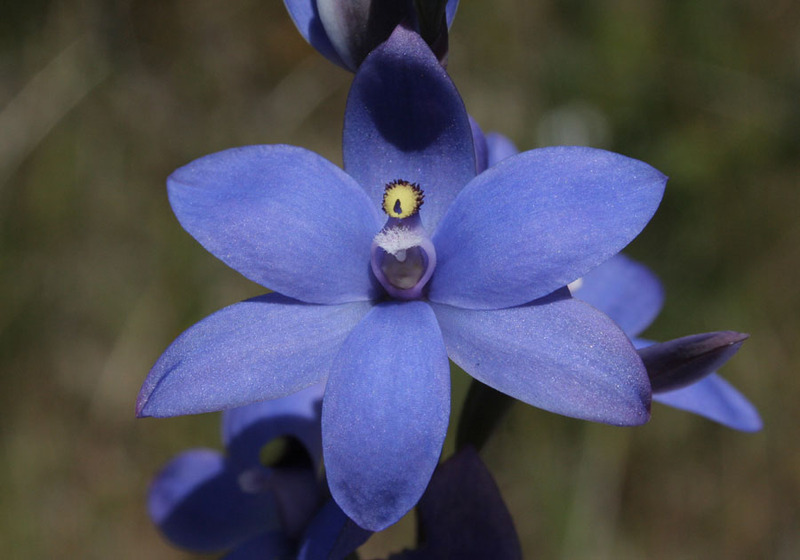 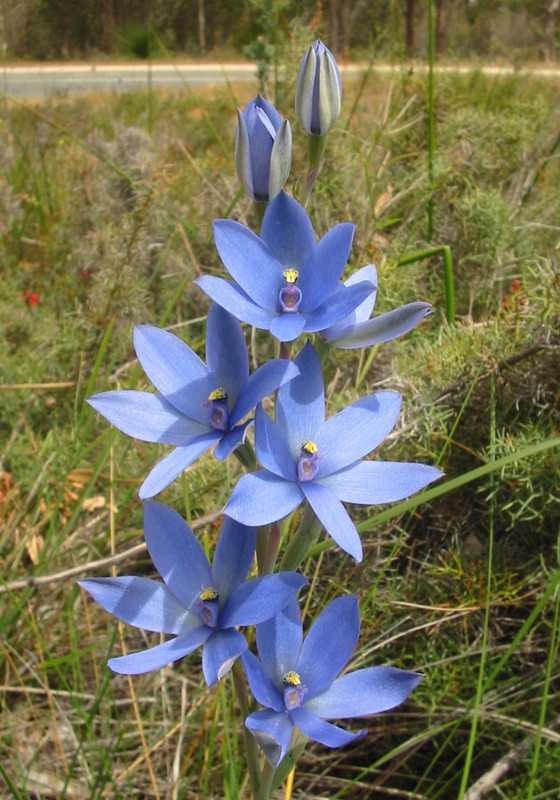 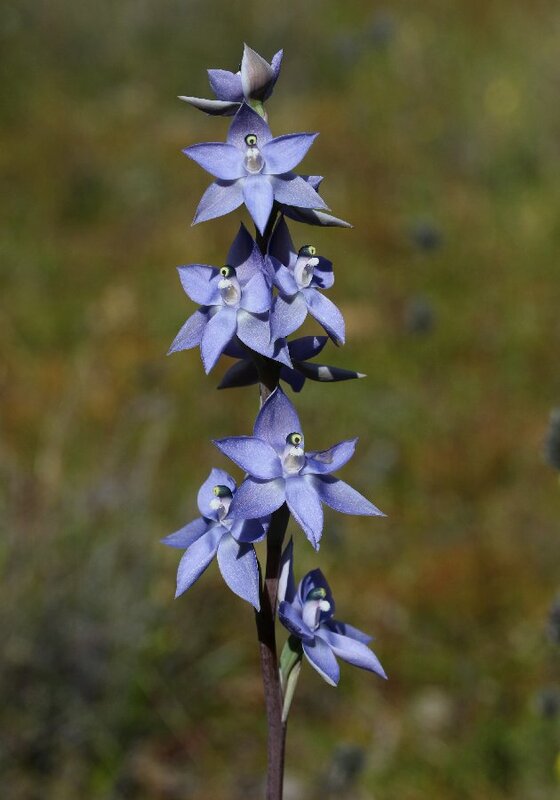 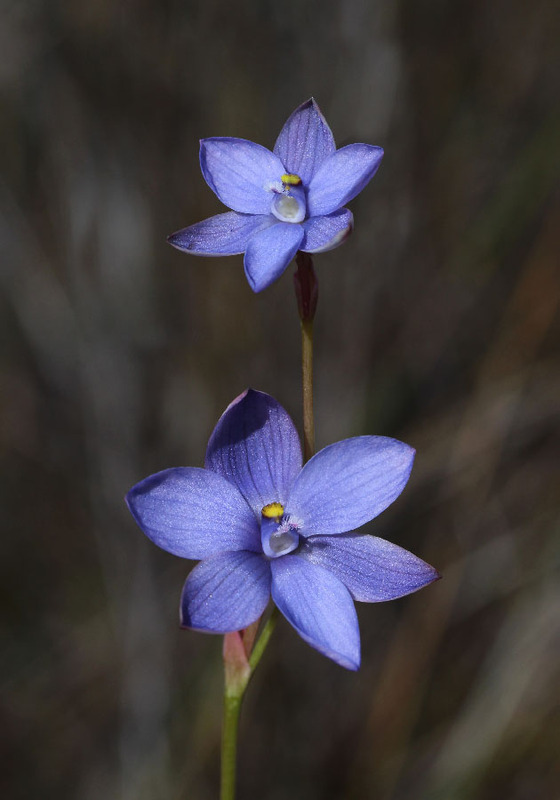 The Blue Sun Orchids are a group of species that all have uniformly mostly blue coloured flowers. 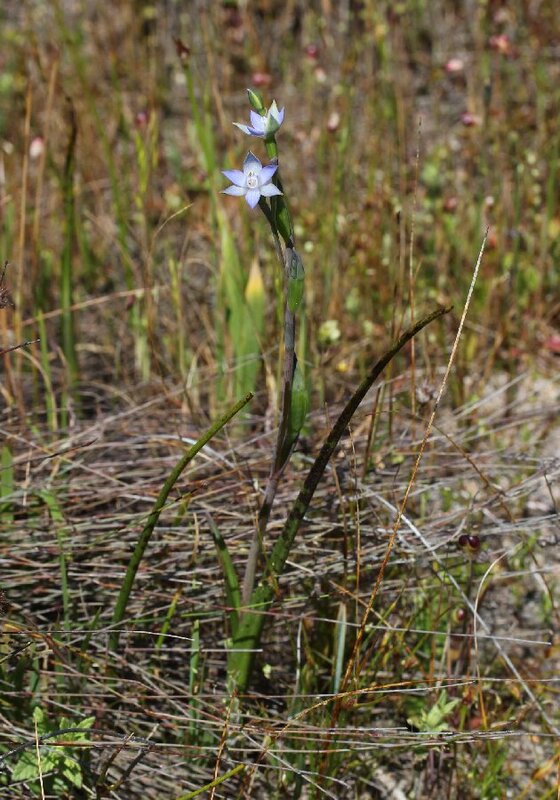 The Scented Sun Orchids are by far the most common species in this group, being very common throughout the south west. 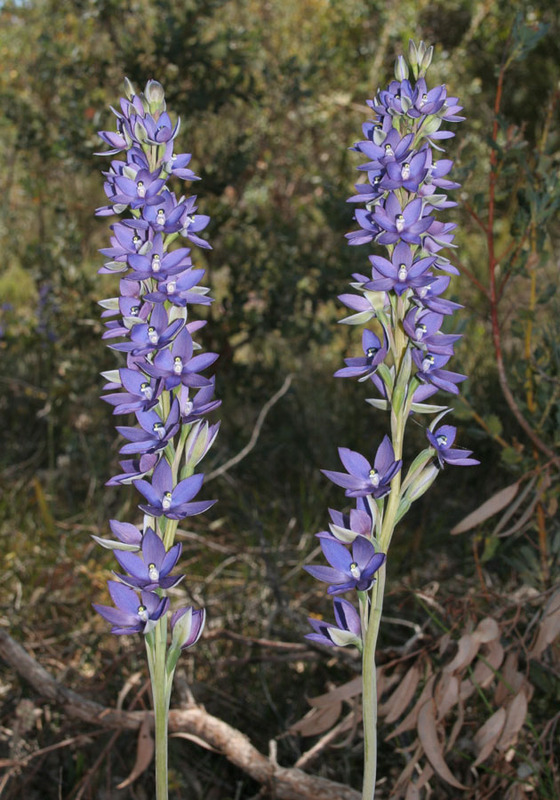 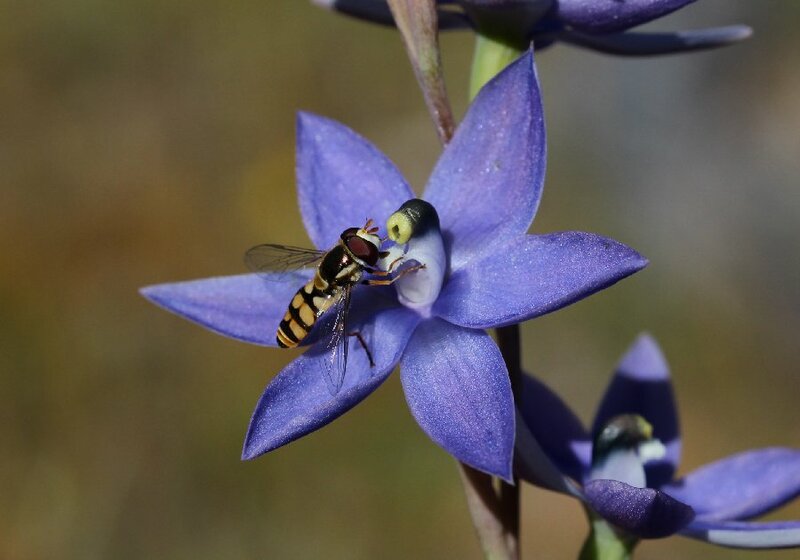 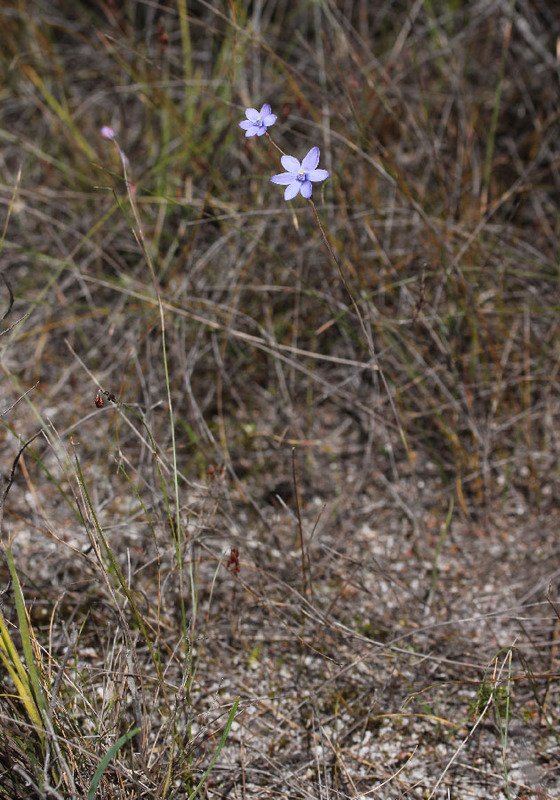 Flowering occurs from August to December, with species found in the north around Geraldton flowering first while those along the south coast can be found flowering into December. 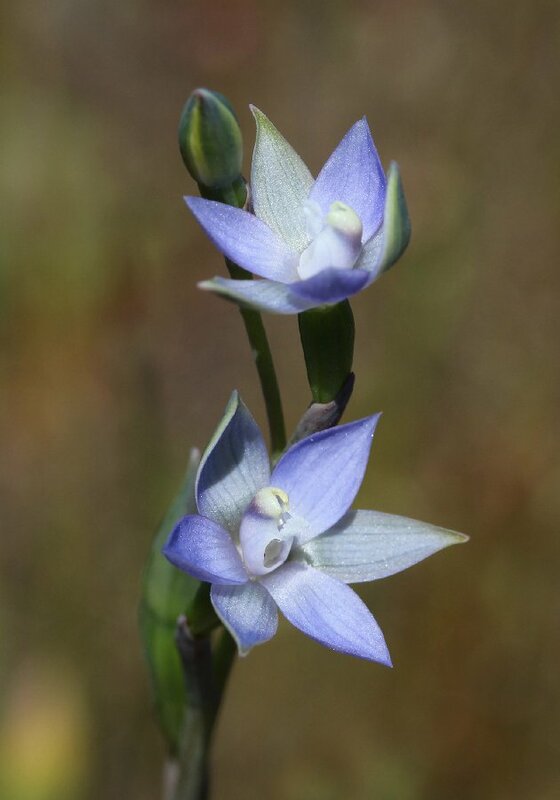 The Blue Lady Orchid is distinguished from the Scented Sun Orchid by its more rounded, deeper blue petals and sepals and generally shorter plants. 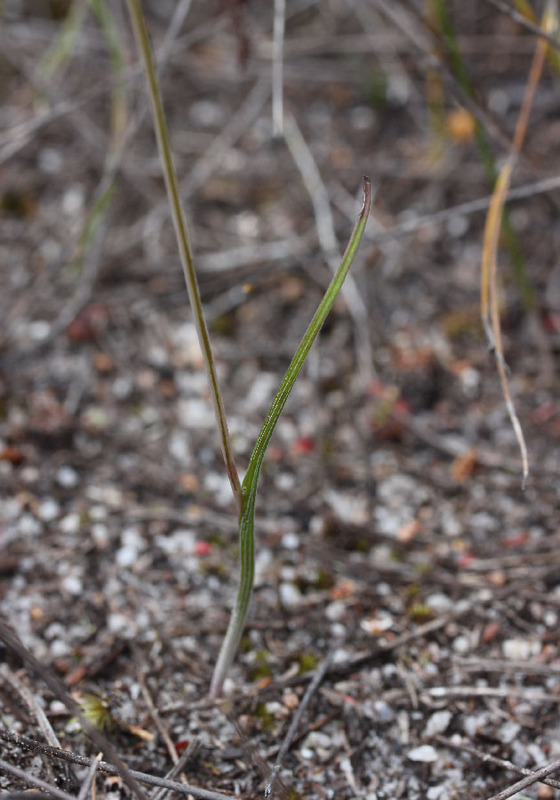 It is also distinguished by its leaf. 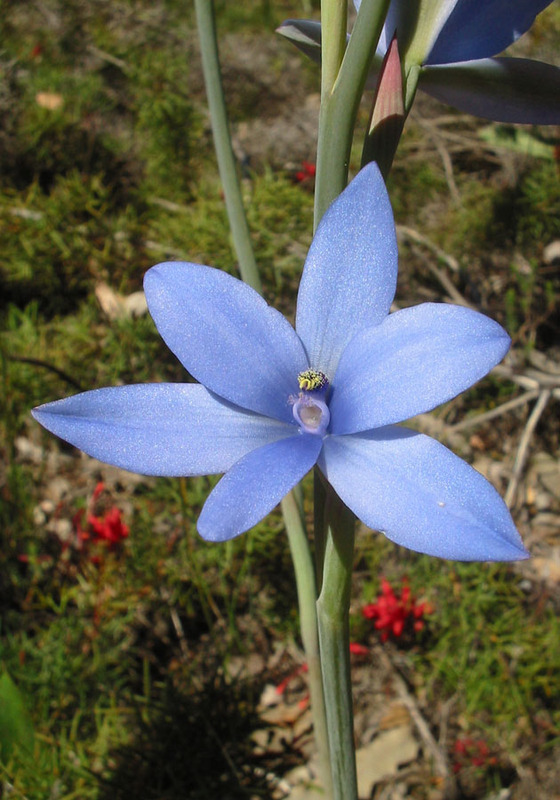 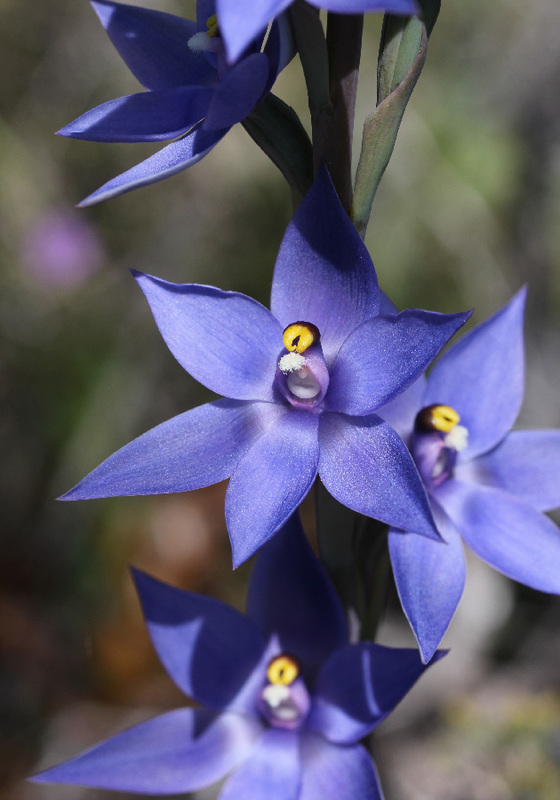 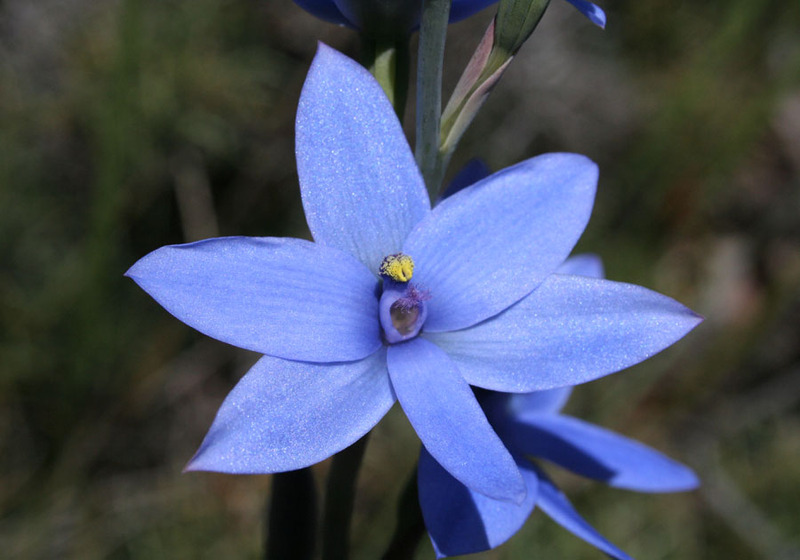 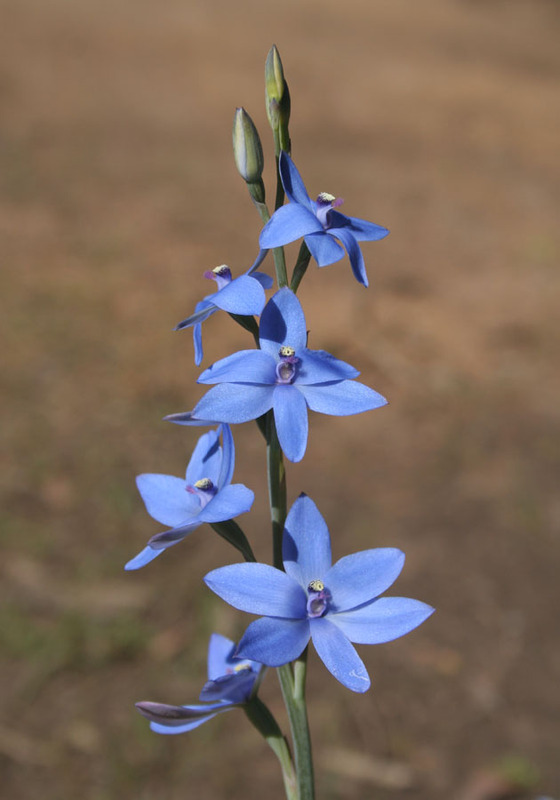 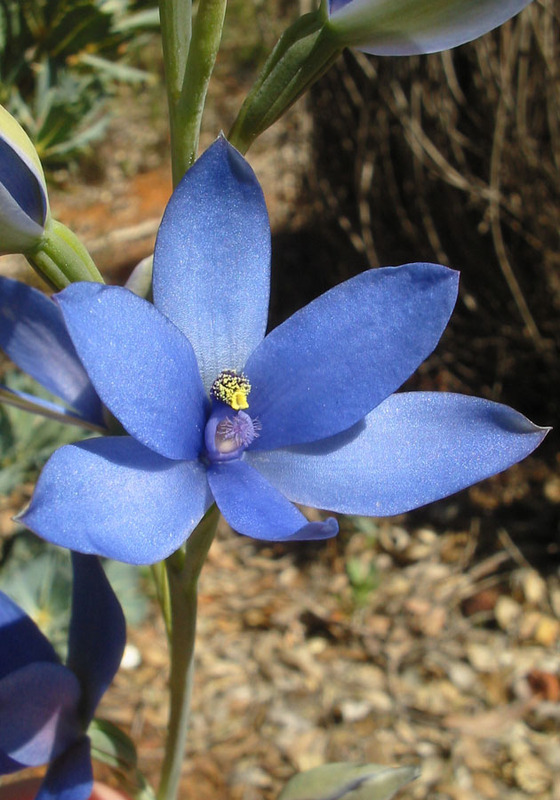 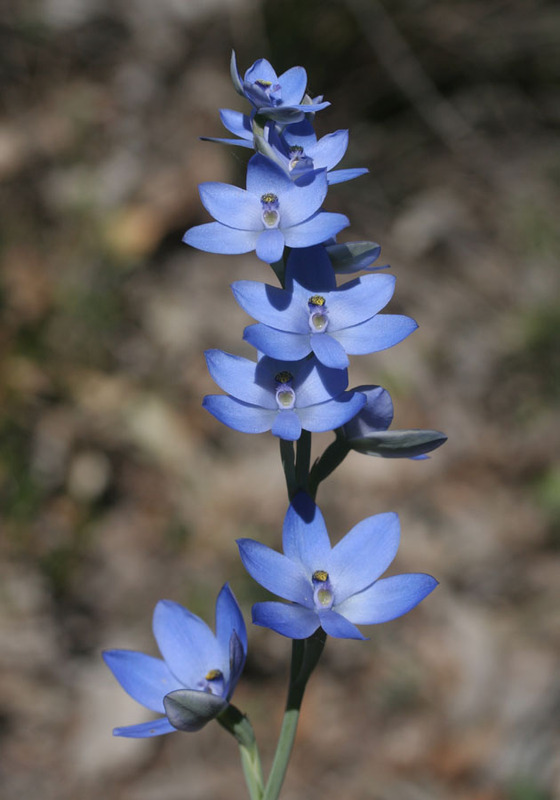 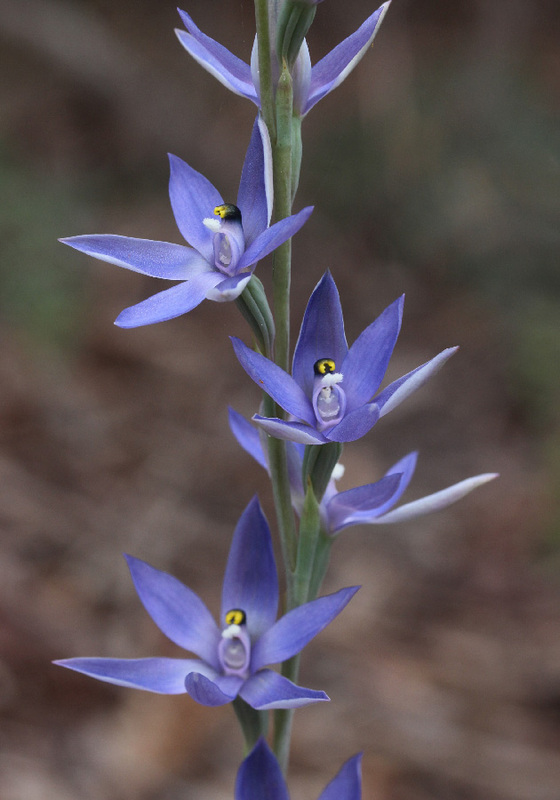 The Blue Lady has a broad leaf up to 10cm long while the Scented Sun Orchid has a long strap-like leaf up to 30cm long. 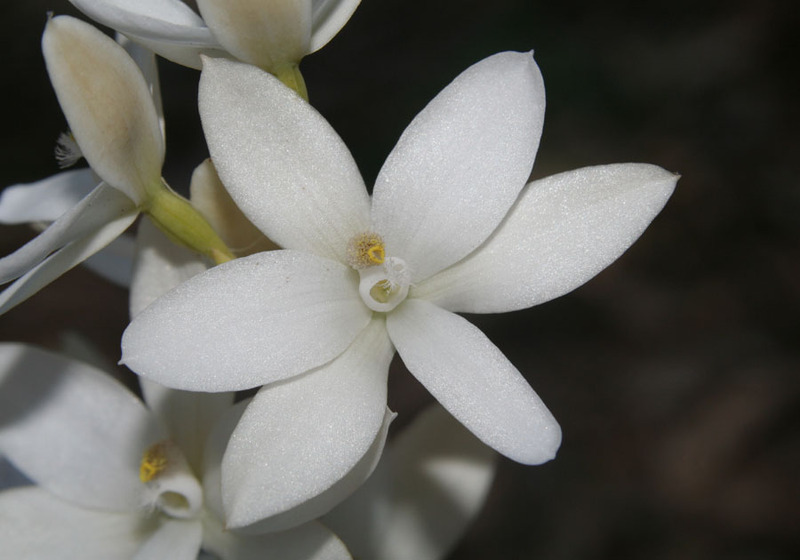 The shape of the column is also different (see photos.) 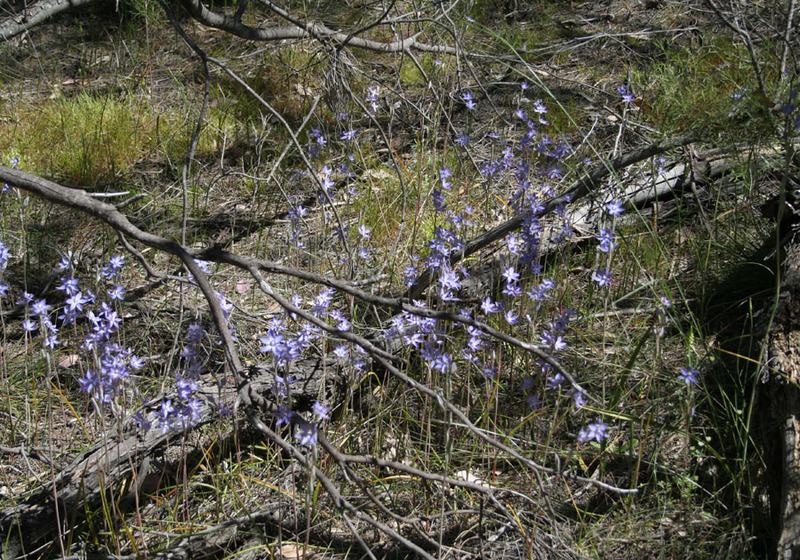 It is widespread between Perth and Albany and flowers from late September to early December (earlier in the north and later in the south). 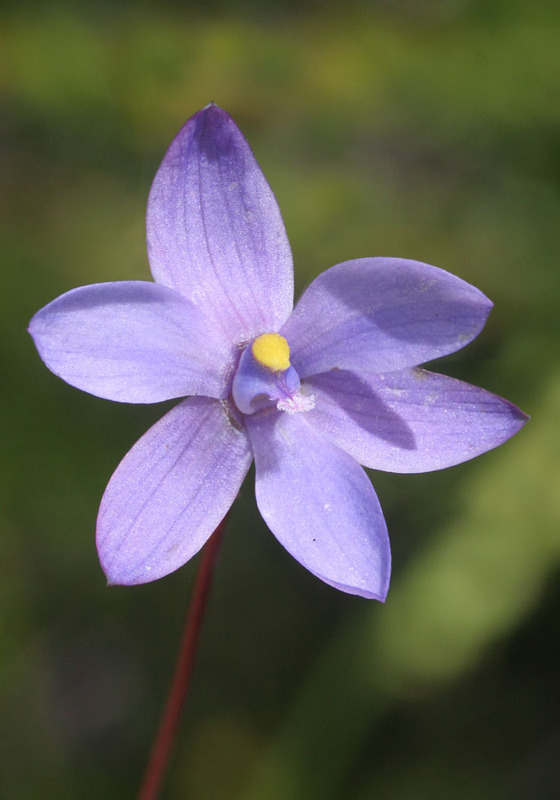 Scented Sun Orchids can be up to 1 metre tall with up to 39 flowers on each plant. 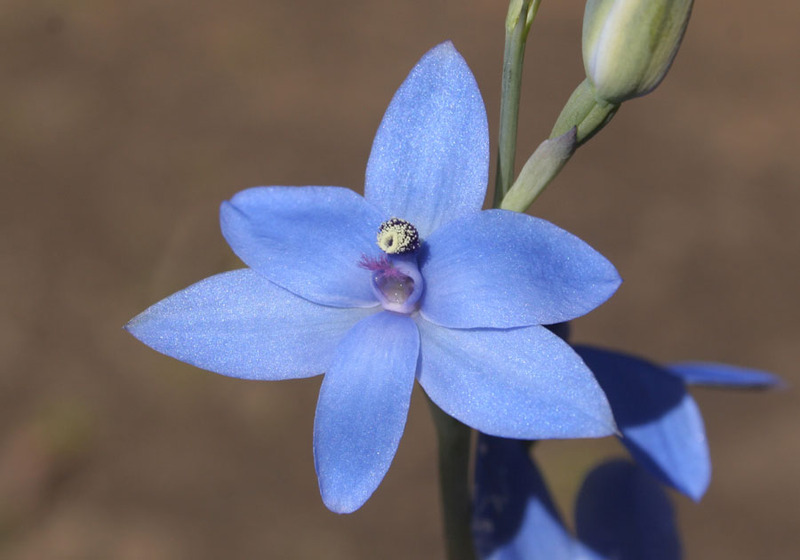 Its sweetly scented blue to purple flowers have pointed petals and sepals. 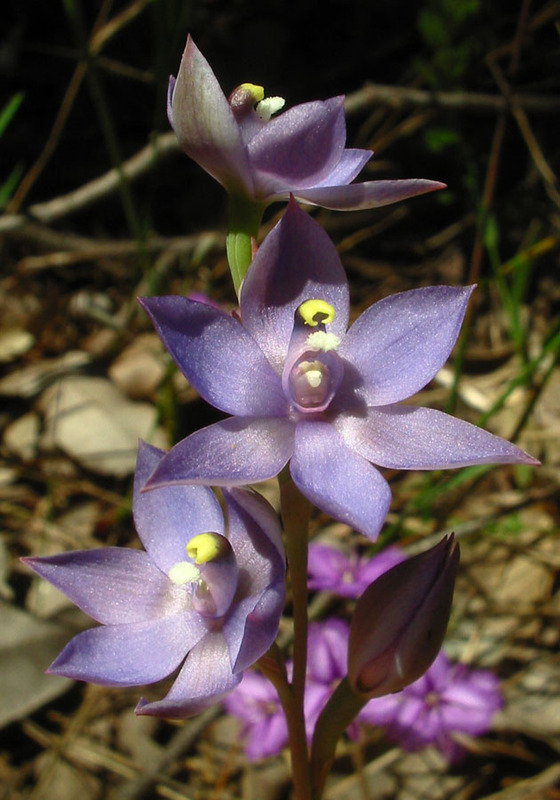 There are many similar species that are very difficult to distinguish. 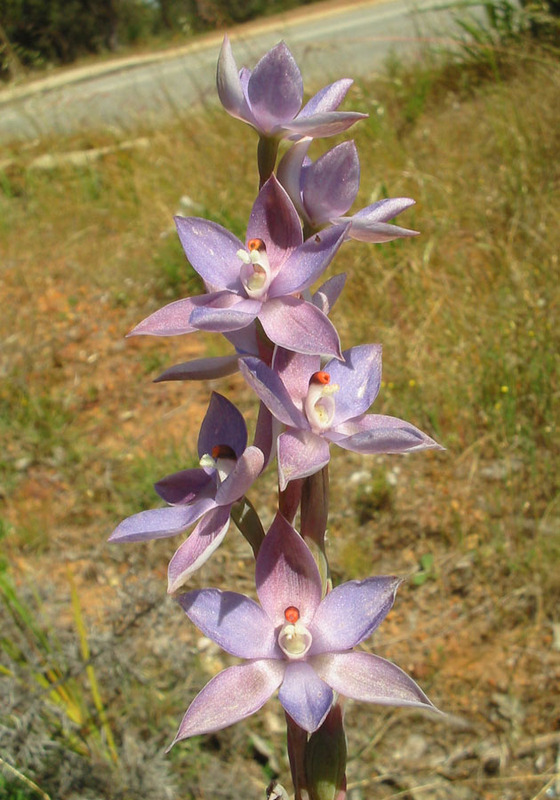 As a group, they are very common throughout the entire south west. 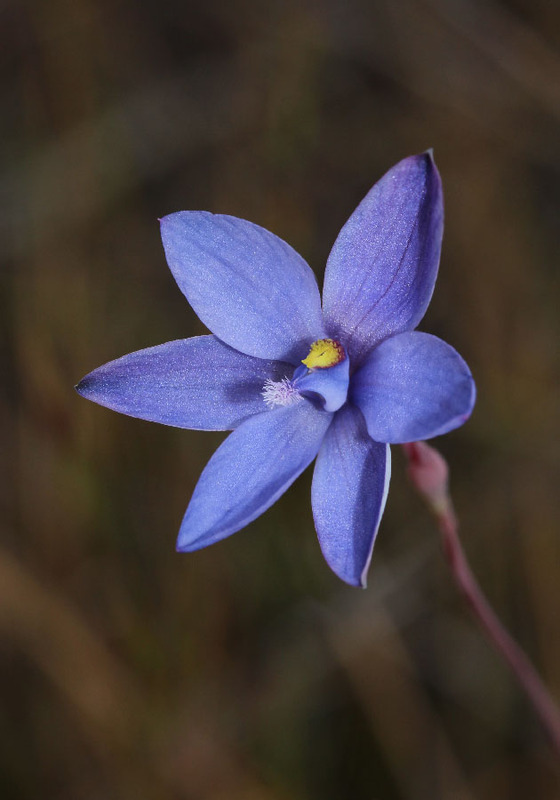 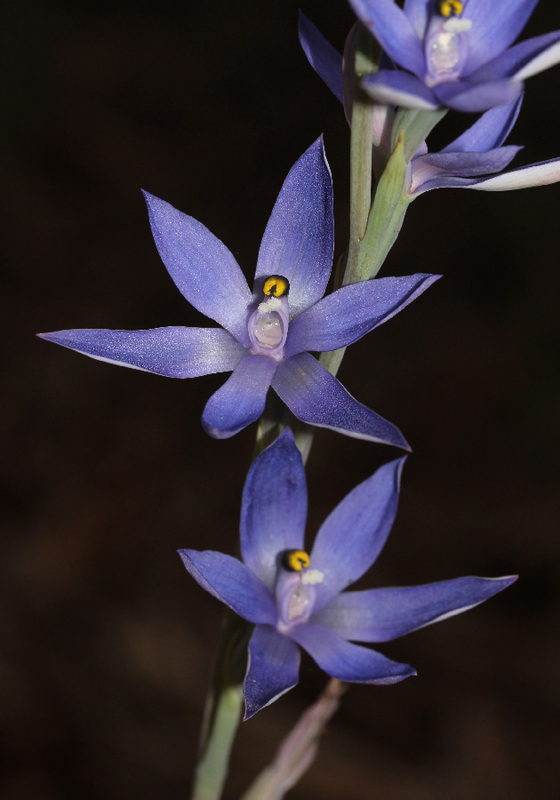 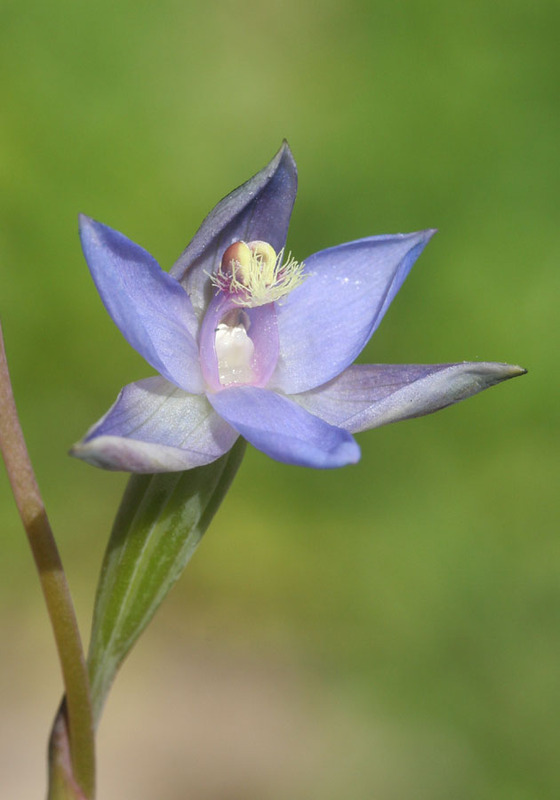 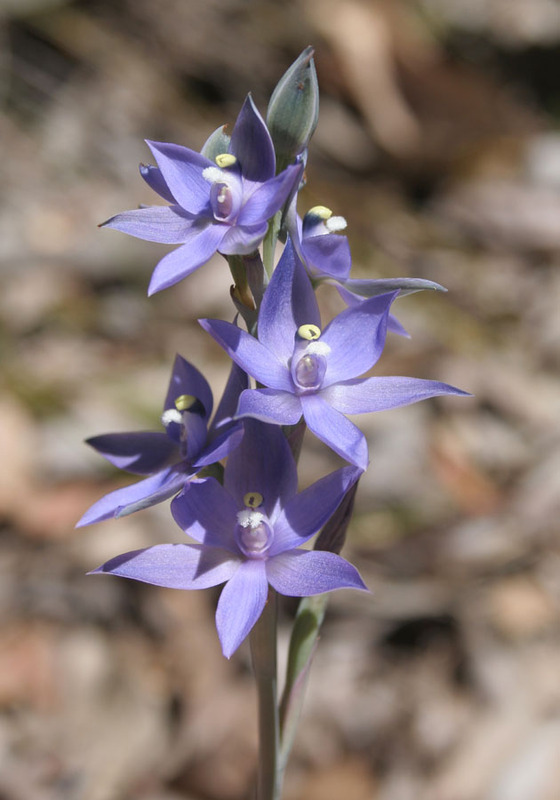 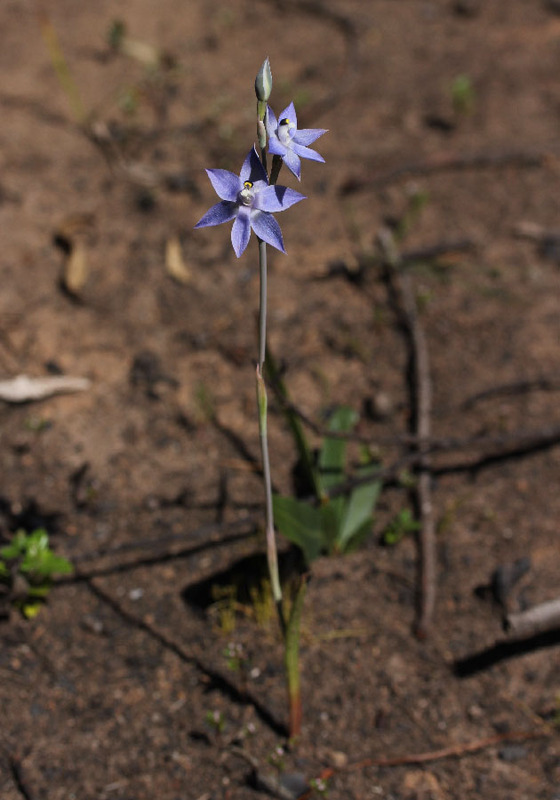 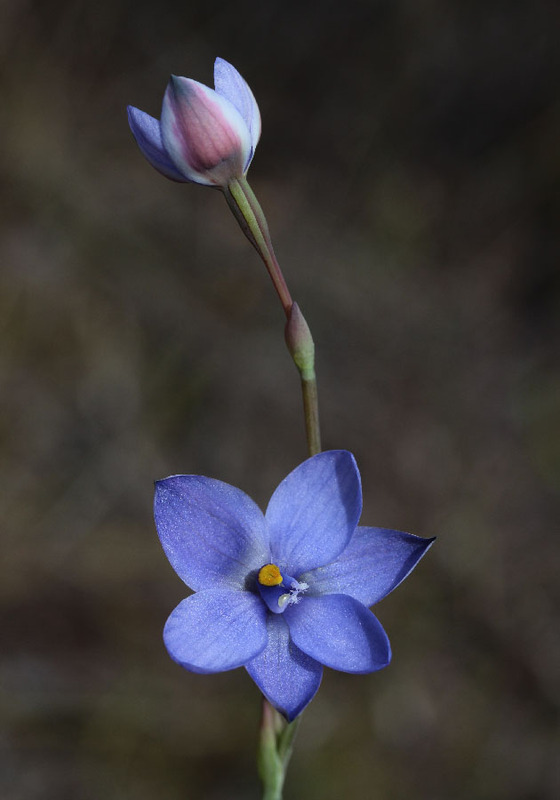 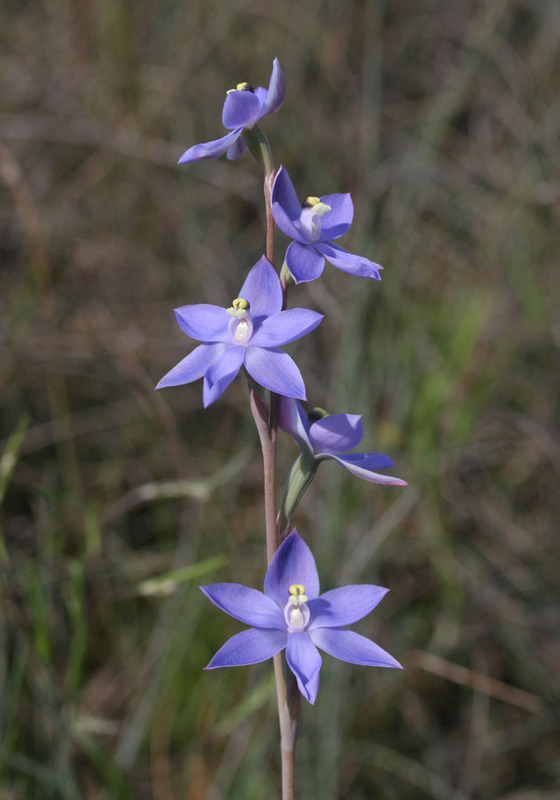 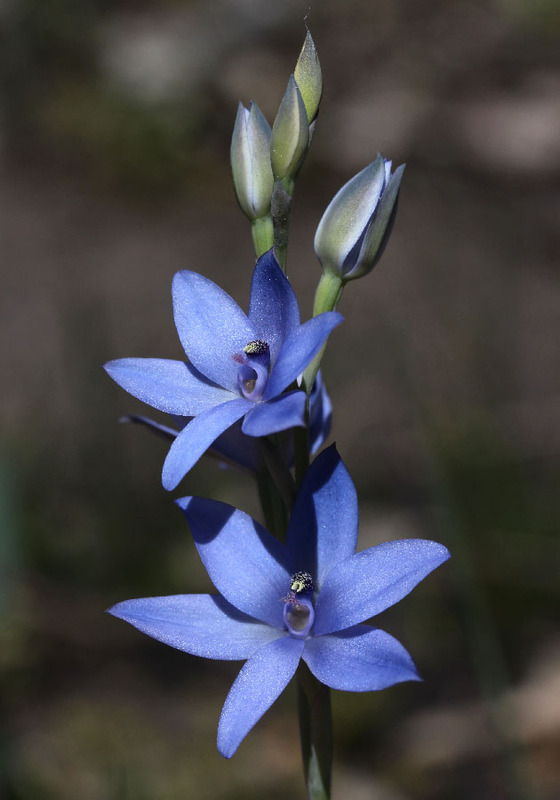 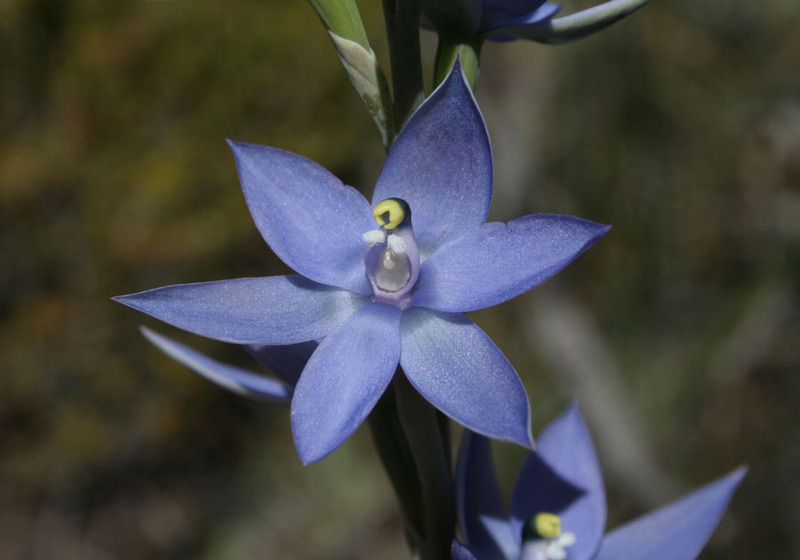 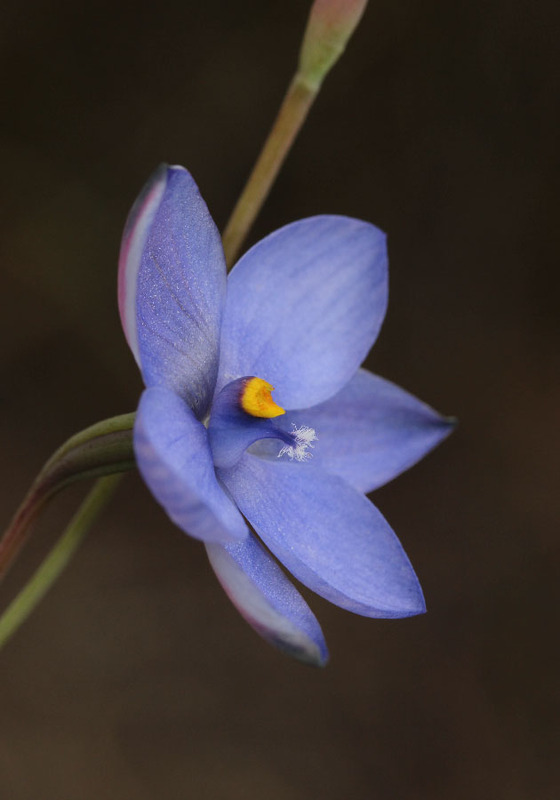 The Shy Sun Orchid looks very similar to the Scented Sun Orchid but has much smaller flowers (2-3cm), less flowers per stem and smaller, less robust plants. 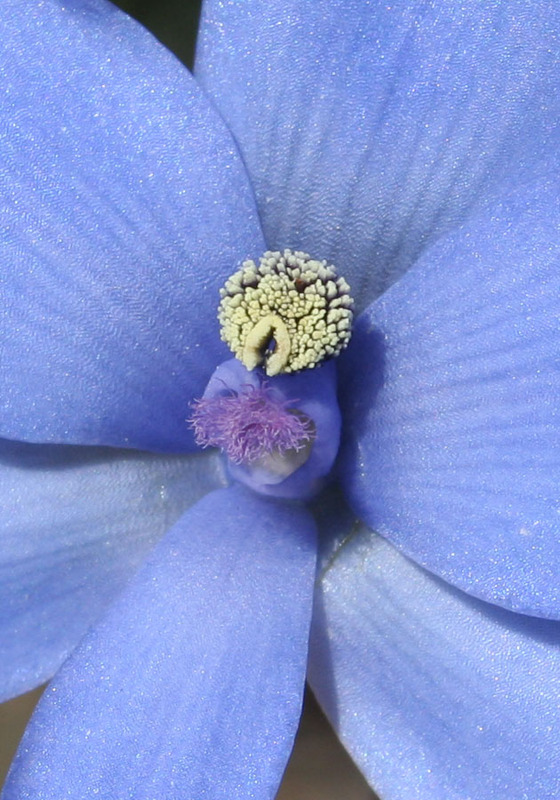 Its flowers are self pollinating, only staying open for a few days at most. 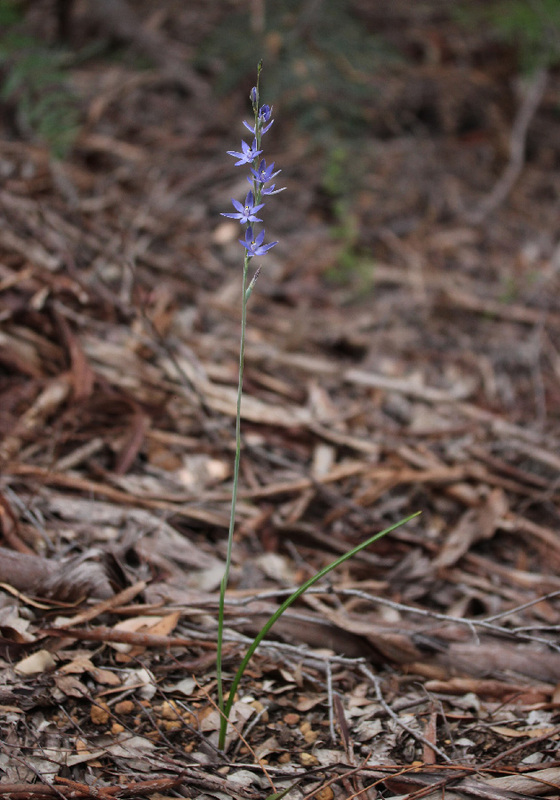 It flowers a few weeks later. 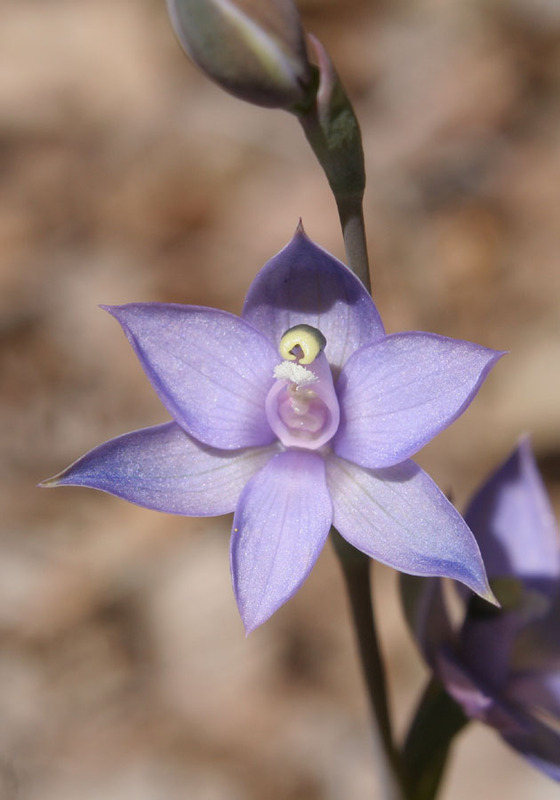 The Lilac Sun Orchid is similar to the Blue Lady Orchid, but is distinguished by the purple colouring of the petals and the thin, rather than broad, leaf. 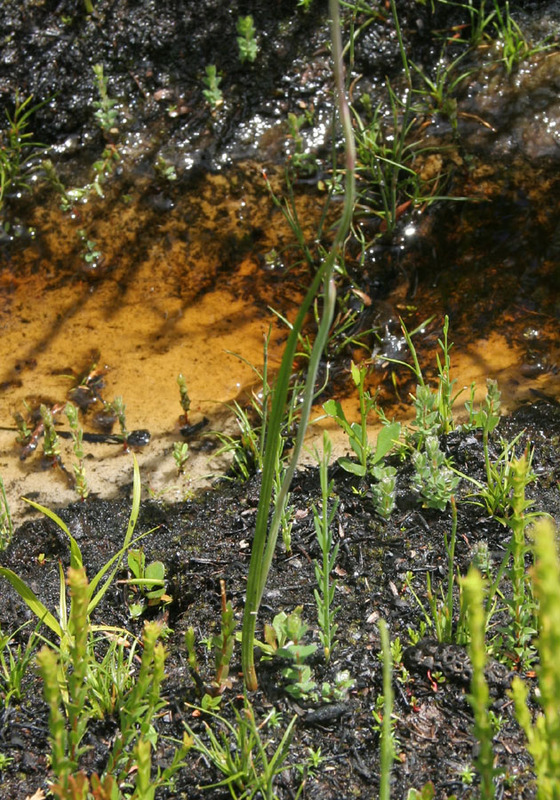 The column has subtle differences too. 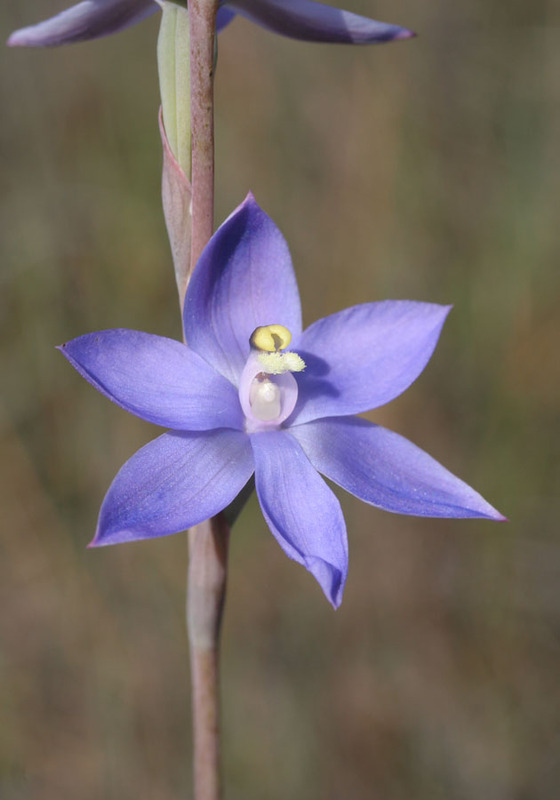 This orchid is found in swampy areas and as such can be difficult to locate unless the habitat has been burnt. 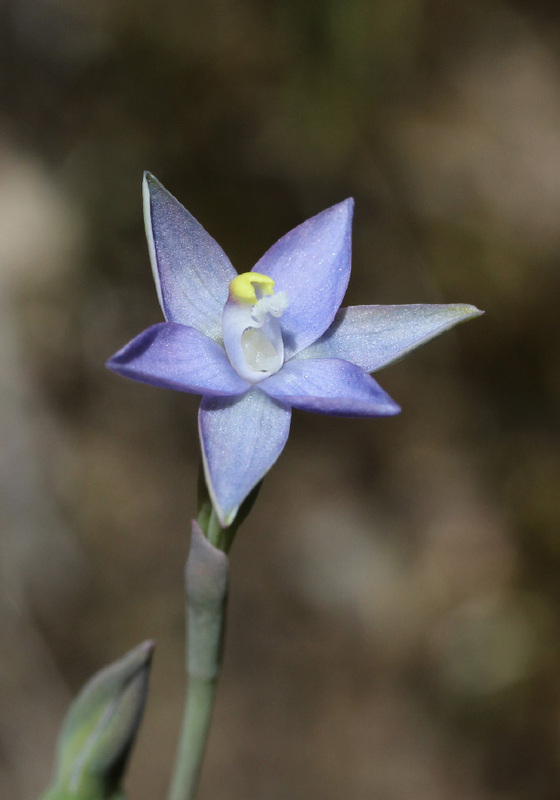 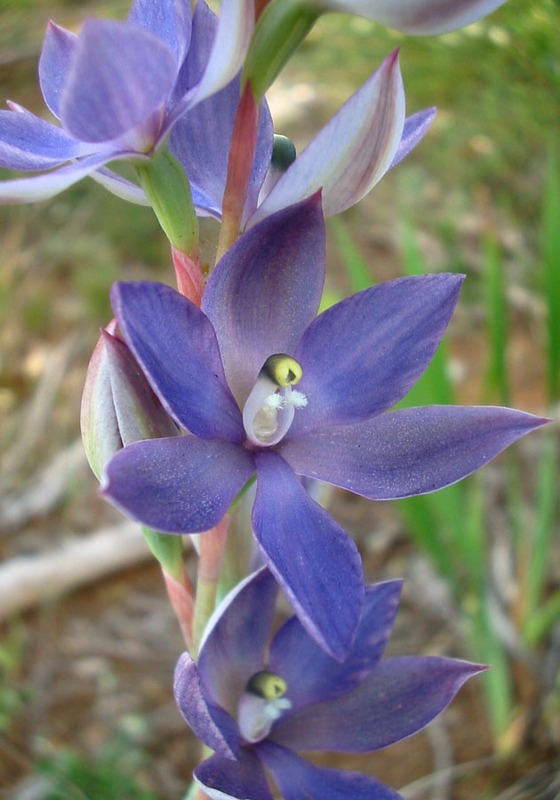 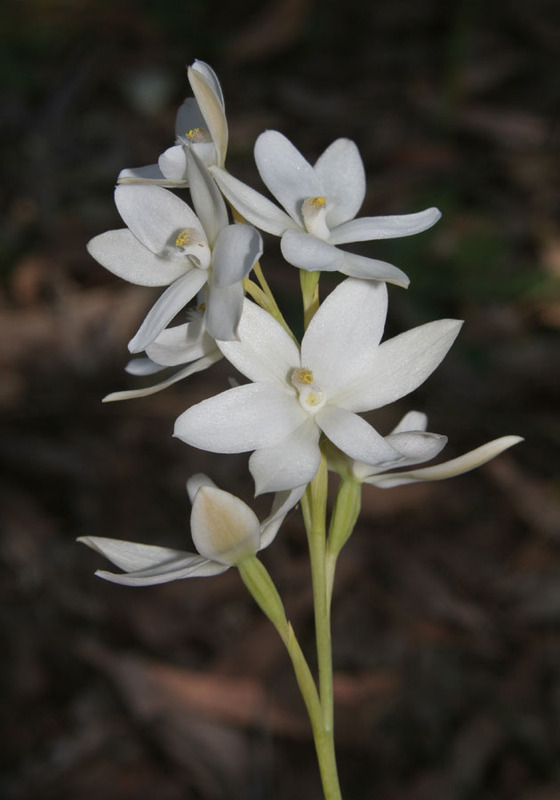 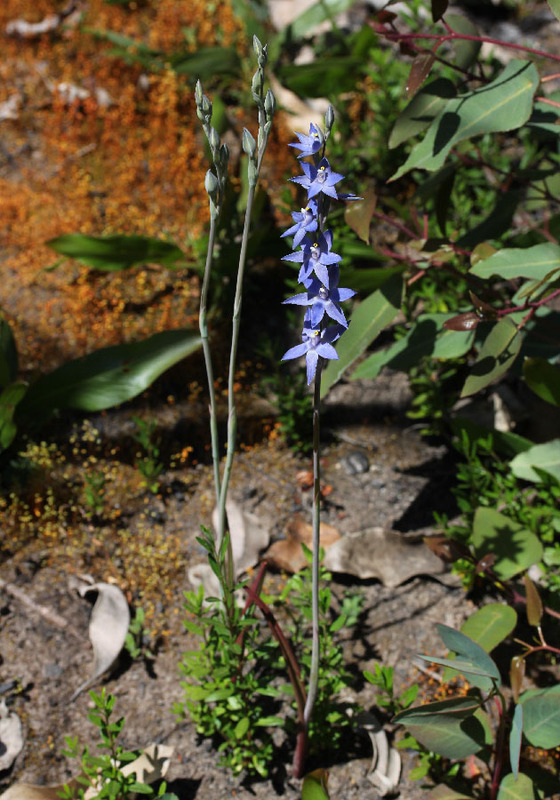 The Granite Sun Orchid has flowers that are much the same as those of the Scented Sun Orchid (T. macrophylla). 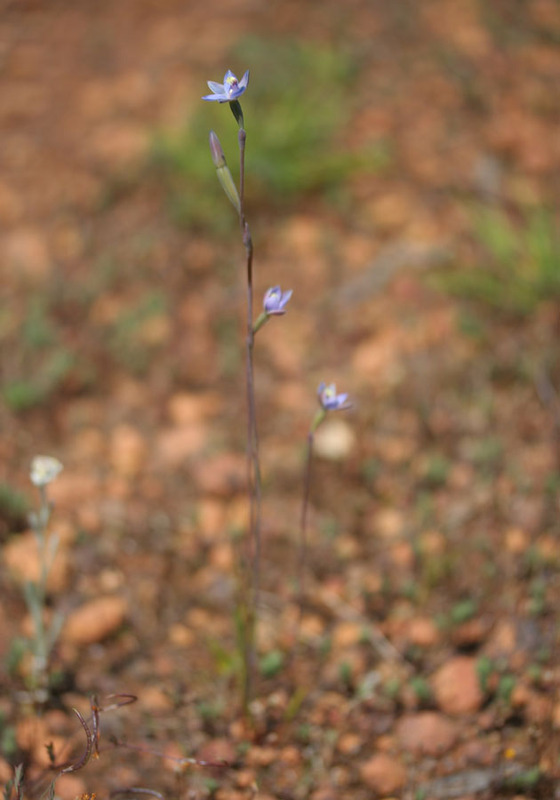 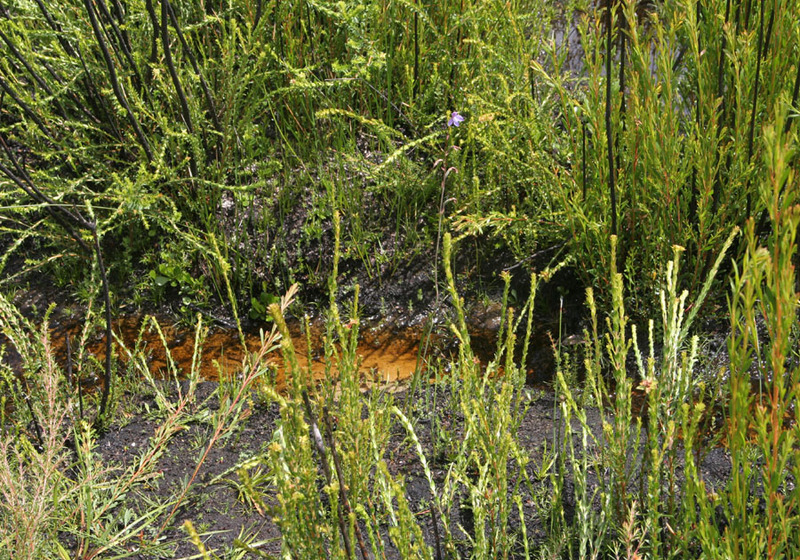 It is found through out the drier areas of the Wheatbelt, mainly being found on and around granite outcrops. 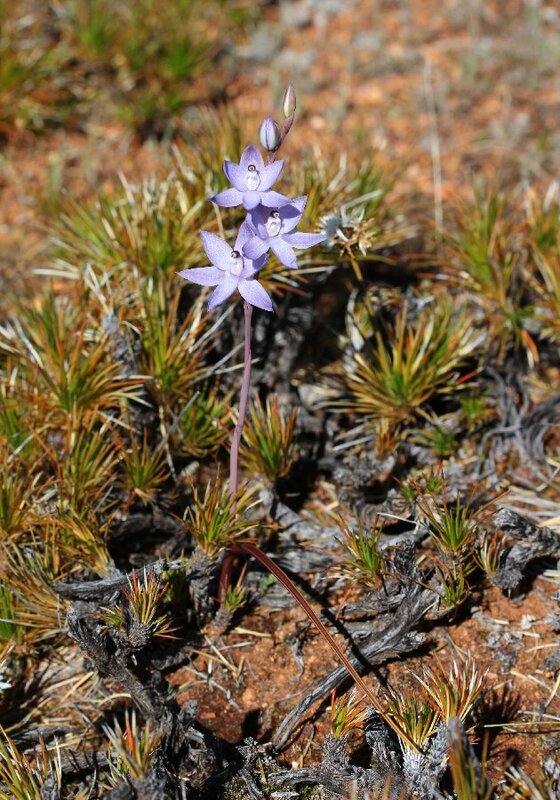 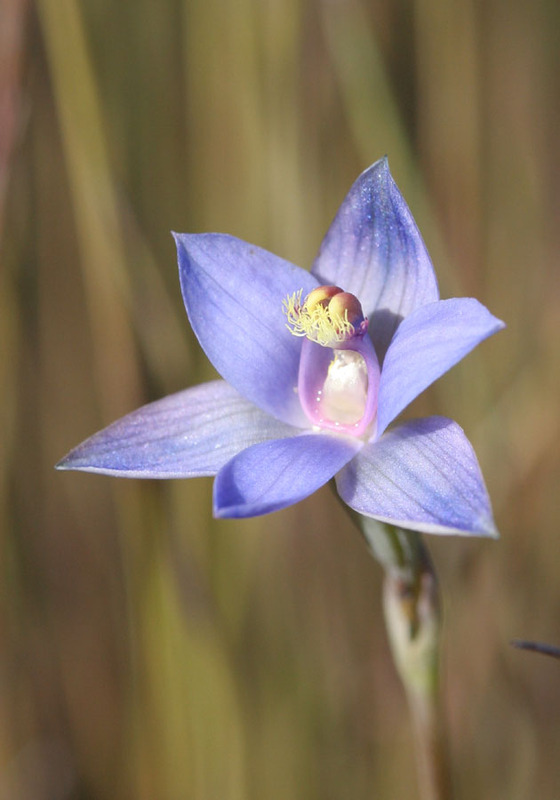 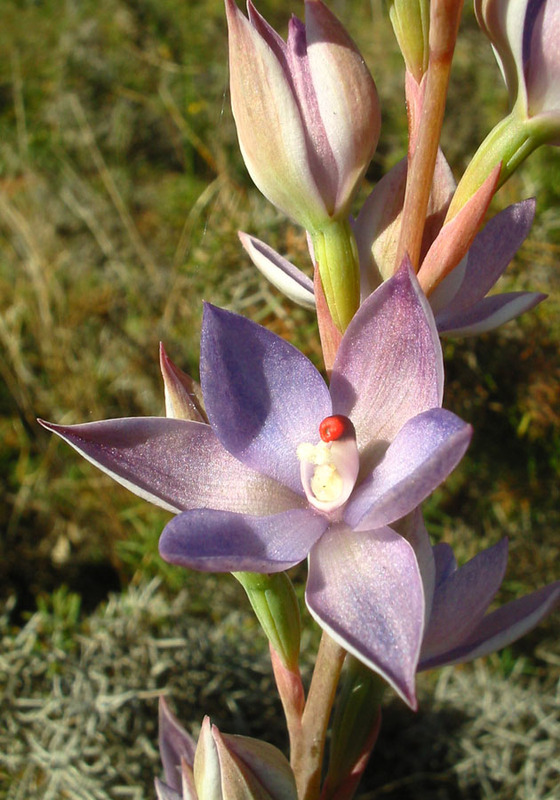 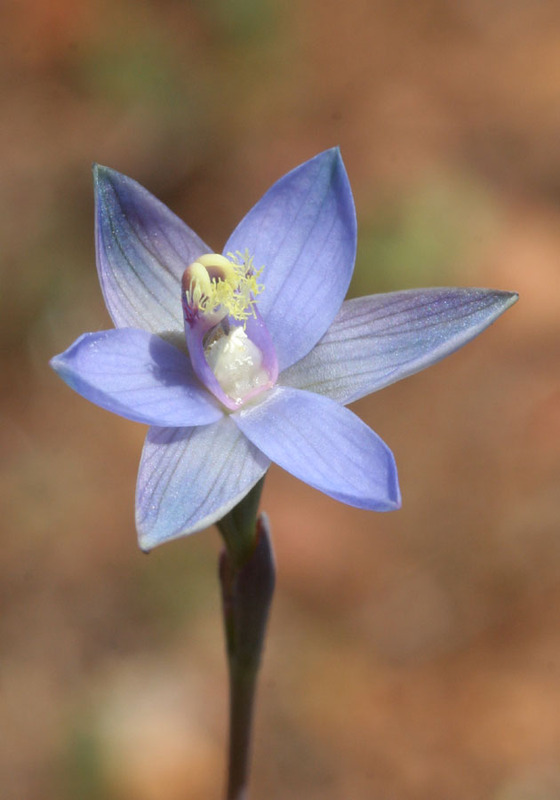 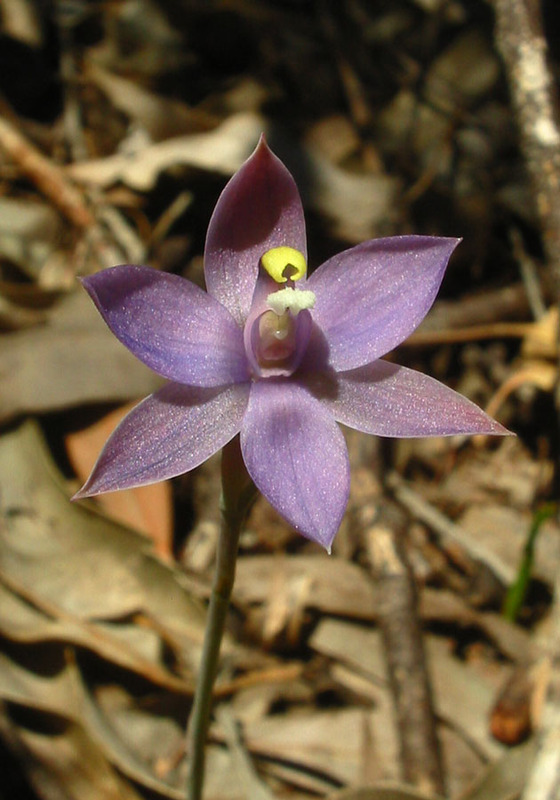 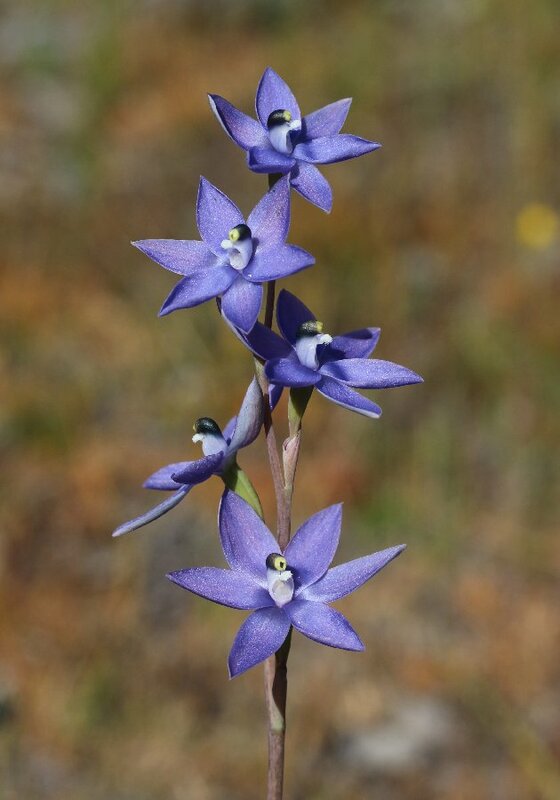 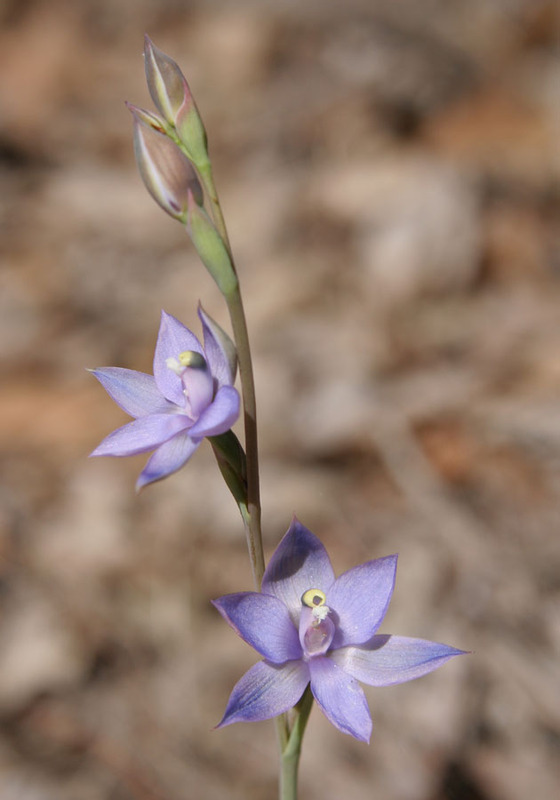 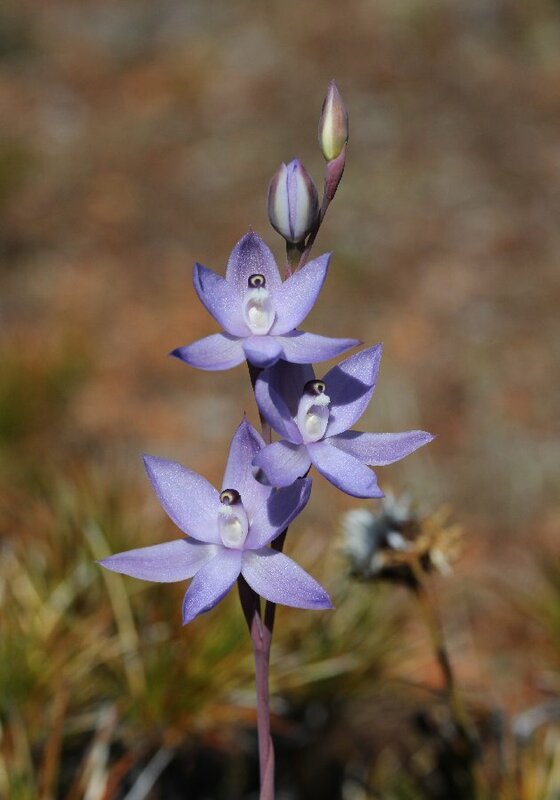 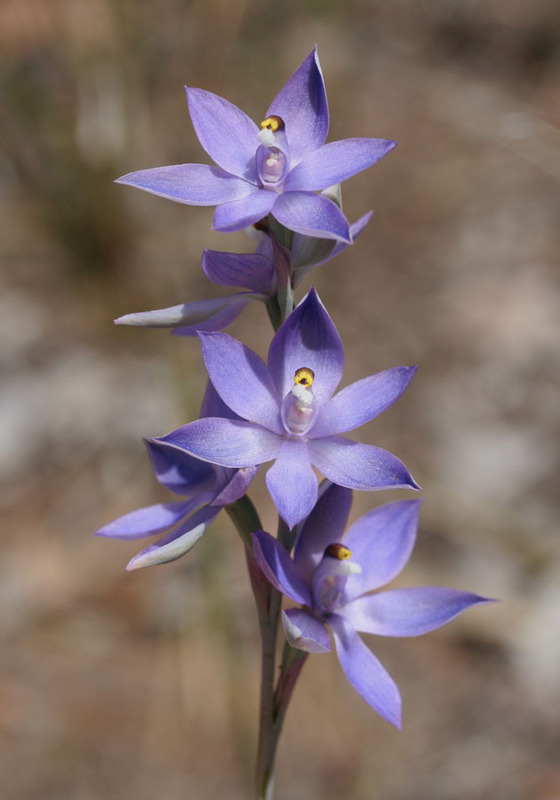 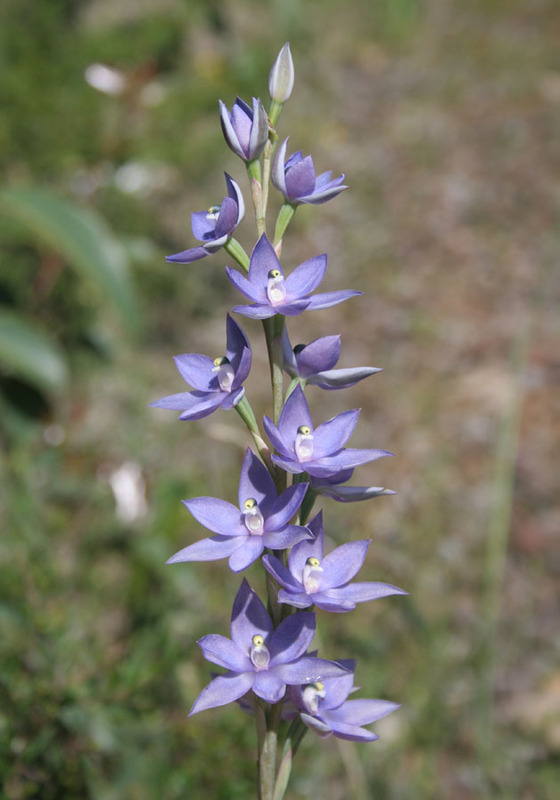 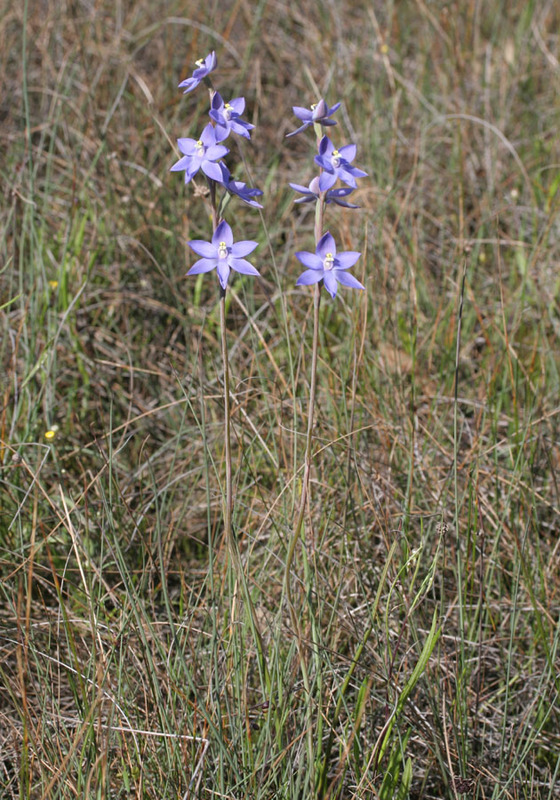 It is the most common of the scented sun orchid group found in inland areas. 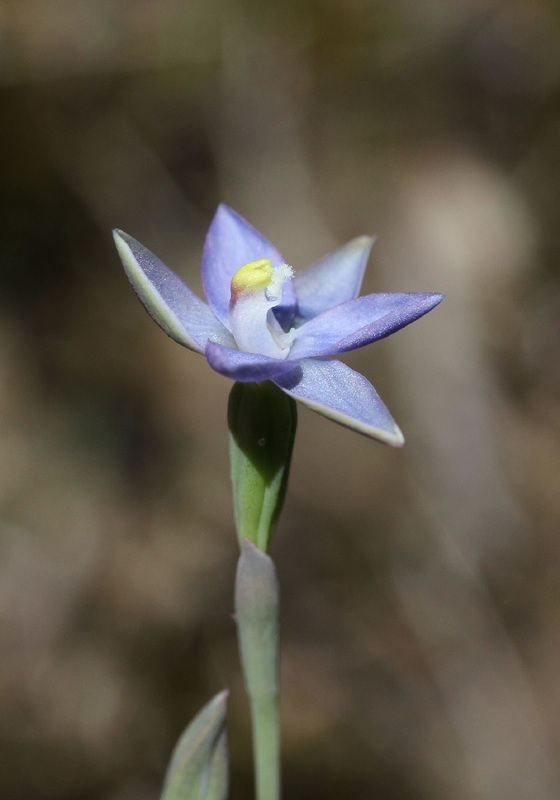 The Slender Sun Orchid is distinguished by its small flowers and by the tufts on the column. 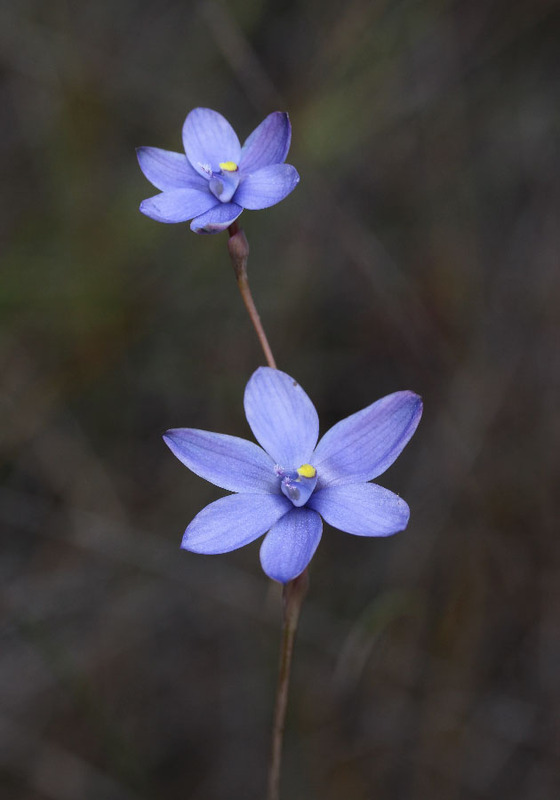 The tiny stalks that support the tufts have a distinct 90 degree elbow. 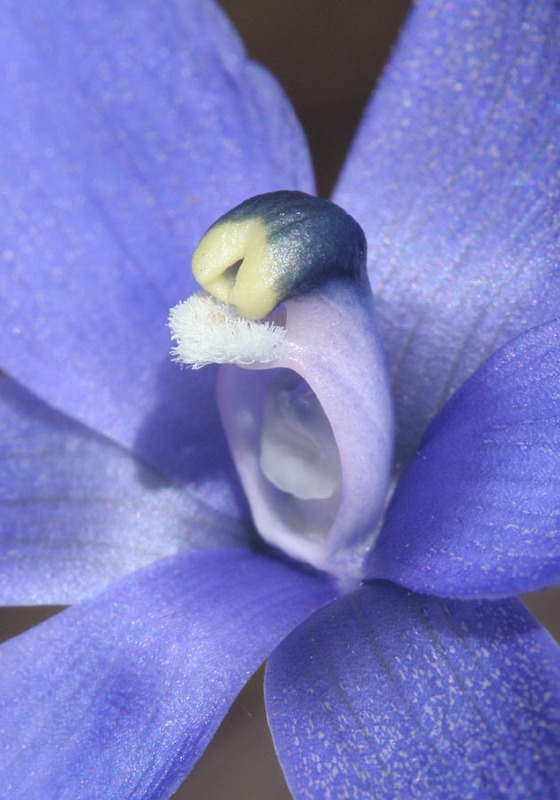 This species is usually self pollinating with flowers that rarely open for more than a few days. 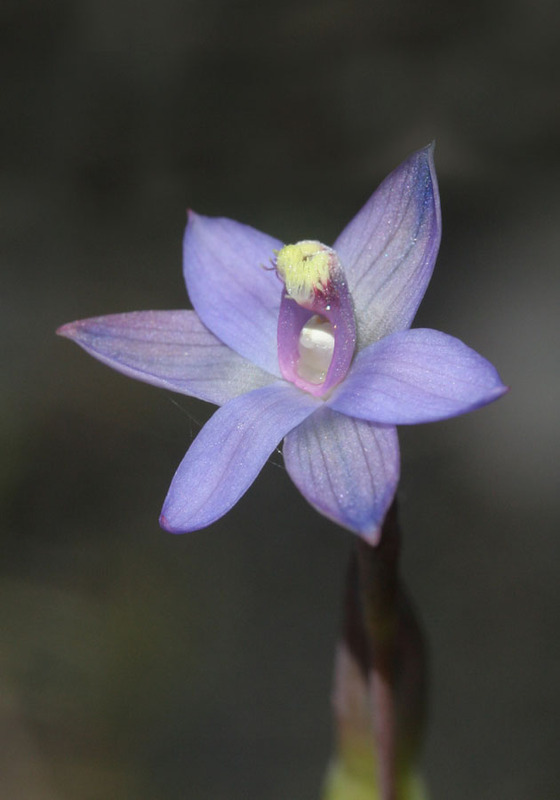 This orchid is similar to the Scented Sun Orchid, but flowers later in the season, from November to Janudary. 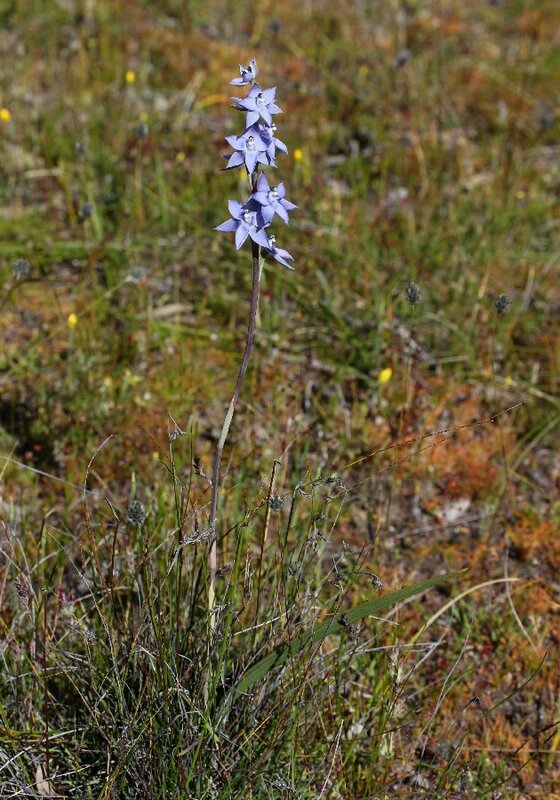 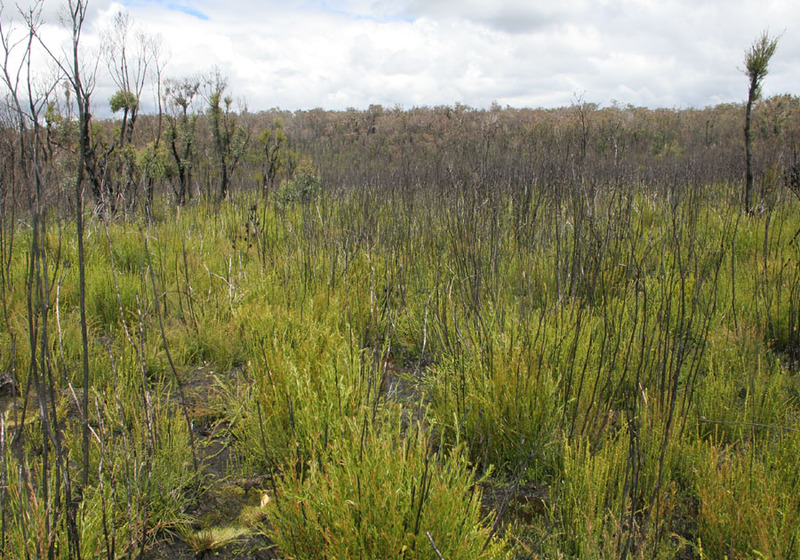 It is found mainly in the lower South-West, particularly on road verges in Karri forest.